Hello friends, and Happy President's Day! The kids are out of school today and are enjoying some time with their grandparents, while I'm taking care of some errands and hoping to hit a thrift store or two. This is one of those posts that I meant to do months ago, and I'm just now getting around to it. 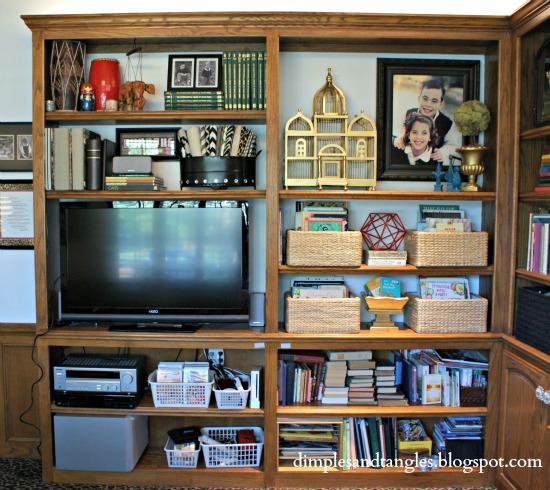 When I re-did our office/tv room, I knew that I wanted to conceal some shelving in the bookcases. There are tons of shelves in this room and we wanted to fit some of them with electronics (stereo, dvd player, wii, etc.) that I didn't necessarily want to be seen. Also, although grateful for the storage, I wanted a few less shelves to style! For a while I considered having cabinet doors made to add to the lower open shelves, but the stereo and dvd player stuck out a bit too far for a cabinet door to close. I've always loved the look of a skirted console, like this one or this one, but haven't had a console that would work to try that treatment out. So, I thought I could use the same idea to skirt the bookshelves. Let's just keep all of those things stuffed under there our little secret, ok? I found a canvas-type fabric for a few dollars a yard, and hemmed all four sides to fit each section that I wanted to cover. Then, I sewed black grosgrain ribbon along the edge. All of those steps could easily be new-sew if you wanted to use a fusible tape or even hot glue or fabric glue. 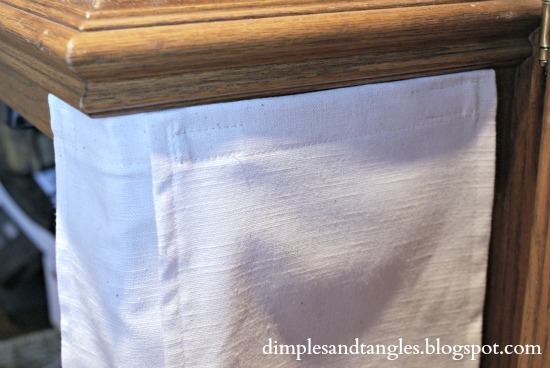 If you glue, I would recommend pressing your seams on all sides before gluing to get a crisper, cleaner looking edge. Next, I purchased some velcro at Hobby Lobby that had an adhesive back on the "hook" strip, and a sew-on back on the "loop" side. 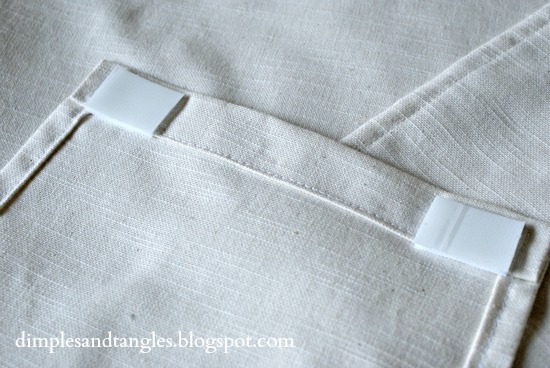 I wanted to be able to sew pieces on the fabric without the adhesive gunking up my needle. So, I sewed little pieces (about 1 1/2" each) on the top corners of all the sections, and added several across the top of the larger sections. Then, I stuck the matching piece together to the sewed on piece, peeled the backing off, and pressed it into place along the top lip of the frame. Adhering it this way makes matching up your pieces fool proof! Then, peel your fabric off and the adhesive sections are secured in just the right place. 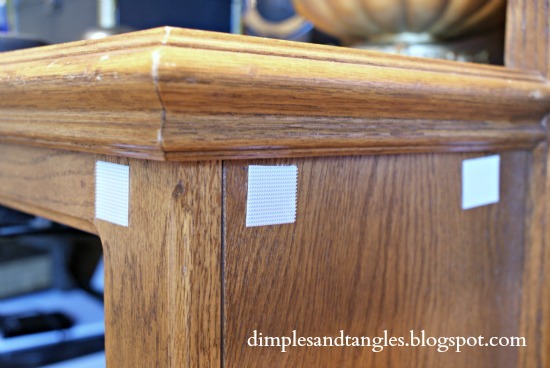 On this section that is the desk, I wanted the skirting to wrap around the sides. I made a small panel to wrap around the corner, then a separate panel for each side along with a large panel on the front. One thing I didn't think about until I was mid-project were the places where my fabric overlapped, like in the photo above. I knew the adhesive back wouldn't stick to my bottom layer of fabric (where I wanted to attach the top layer), so I used some velcro that I had on hand that was a sew-on "hook" strip and sewed it to the bottom layer. Then I attached the top layer directly to the fabric underneath it wherever the two pieces overlapped. One bonus, the remotes still work with the skirting in place. However, we often remove a panel if needed for continual access and it's super easy to pop them off and on. There's also a skinny panel of fabric underneath where the two pieces below meet in the center. I hope that all makes sense, it was harder to explain that it was to do. 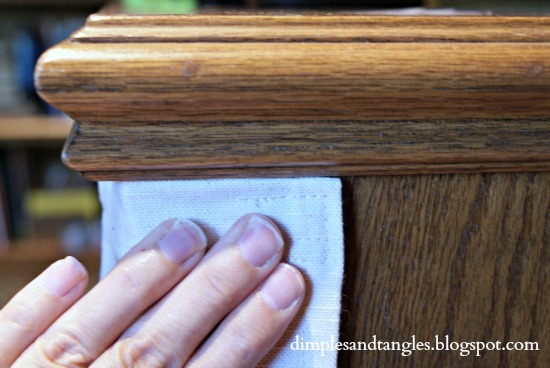 Basically, to make a long story short, use adhesive and sew-on velcro to attach panels of fabric to the wood. Did you watch the season finale of Downton Abbey last night? No spoiler alerts here and I love the series, but I thought it was a bit boring, until the end, and I kind-of saw that coming. What did you think? That looks terrific. I've used the same technique to hide the mess of computer wires behind my desk. what a difference! it totally cleans it up! so sleek! I love your office and what you did with the fabric. The area you painted above the desk is still my favorite thing in there! I have a small bench similar to the two you have by the sofa and I think I'm going to recover it like that. You have such good ideas! Such a creative and pretty solution!! Love this idea!! I am pinning it for our office which also has a wall of oak built ins. Love that clean, crisp look! 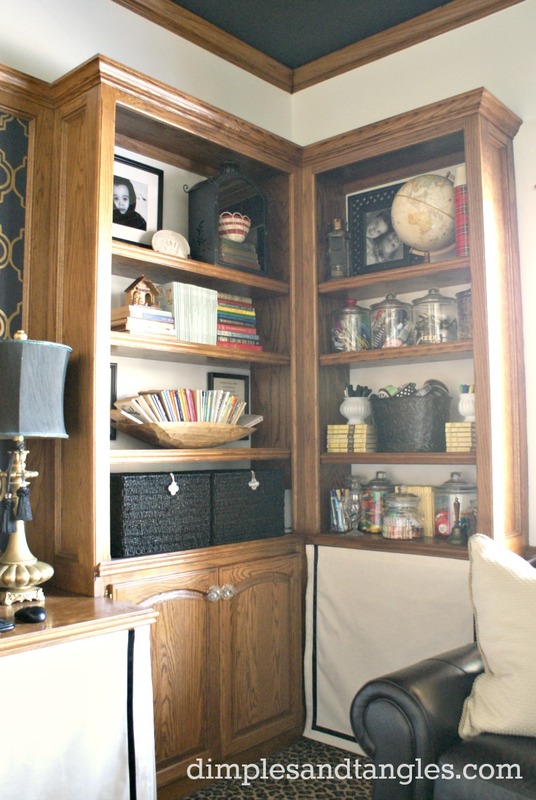 Anything to pretty up my clutter, with easy access is a winner! So so smart!! You've got the wheels turning in my head….I could use this trick in more than one spot in my house. Love how it streamlines a room, hiding all the clutter. Thanks for sharing how you made the panels!